Amazing home for sale on a beautiful piece of property in Rexburg, Idaho! Estate sits on a little over five acres with river frontage right on the Snake River. 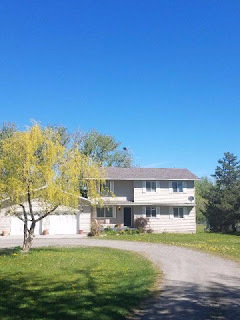 Most of the five acres are nicely landscaped with a full sprinkler system, huge garden spot, mature trees (including apricot, cherry, plum, peach, chokecherry and raspberry bushes) and flower beds. There is an attached 648 square foot garage, a pump house, as well as a storage shed for your garden tools. Beautiful new composite deck and covered patio with unbeatable views. Inside the estate you will find approximately 3,092 square feet including 5 spacious bedrooms with great closet space. There is a nice a sitting room/office/den. There is one full bath, two 3/4 baths and one half bath in the laundry room. This home has been freshly painted, has brand new carpet, new granite, new fixtures, new appliances including a double convection oven and beautiful oak hard wood floors. There is a propane furnace and two propane fireplace inserts to keep you nice and cozy on those winter nights. Since this home is on the river it is in a mosquito abatement district, meaning mosquitoes are sprayed daily so they are not a problem. There is wildlife everywhere on the property that you can enjoy from every angle. Call Hamilton Realty today to check this out before it's gone! 208-624-4382. Priced at $459,0.00.